In the latest mass shooting, authorities are looking at multiple factors, from terrorism to the shooter’s state of mind. Early Sunday, Omar Mateen shot up a nightclub in Orlando popular with the gay community, killing 50 and wounding 53, according to police. Investigators are looking into the background of Mateen, a 29-year-old security guard and U.S.-born son of Afghan immigrants. Mateen called 911 from inside the nightclub and pledged loyalty to the Islamic State. Terrorism isn’t the only motive that has come up. The shooter’s father and others have suggested Mateen may have been motivated by hatred of gays. Mateen’s ex-wife said he showed signs of “emotional instability, sickness… He was mentally unstable and mentally ill [and] obviously disturbed, deeply, and traumatized,” said Sitora Yusify, who spoke with reporters from her home near Boulder, Colo. The couple divorced in 2011. Metzl pored through data and reports about guns and mental illness over the past 40 years for a study, “Mental Illness, Mass Shootings and the Politics of American Firearms,” published in 2015 the American Journal of Public Health. His research showed that less than 5 percent of the 120,000 gun-related killings in the U.S. between 2001 and 2010 were committed by people diagnosed with mental illness. Other factors far more likely to be associated with shootings included an individual’s history of violence, Metzl said. Drinking or drug use at the time of an emotionally charged conflict and the presence of a firearm, especially in suicide cases, were also common factors, he said. “There’s no mental illness diagnosis whose symptoms including attacking or killing someone,” he said. Less than 5 percent of the 120,000 gun-related killings in the U.S. between 2001 and 2010 were committed by people diagnosed with mental illness. Studies in several cities and states have found that at least half of people shot and killed by police were having mental health problems, he said. But Metzl understands why the public might see a connection between mental illness and gun violence, especially after highly publicized crimes. “When you see shootings like those at Newtown, Conn., or Aurora, Colo., it’s hard to argue that mental illness didn’t play a role,” he said. But the shooter’s mental state is only one of several factors involved, he said. Adam Lanza killed 20 first-graders, six adults and himself at Sandy Hook Elementary School in Newtown in 2012. He had been diagnosed with Asperger’s syndrome, a developmental disorder related to autism. 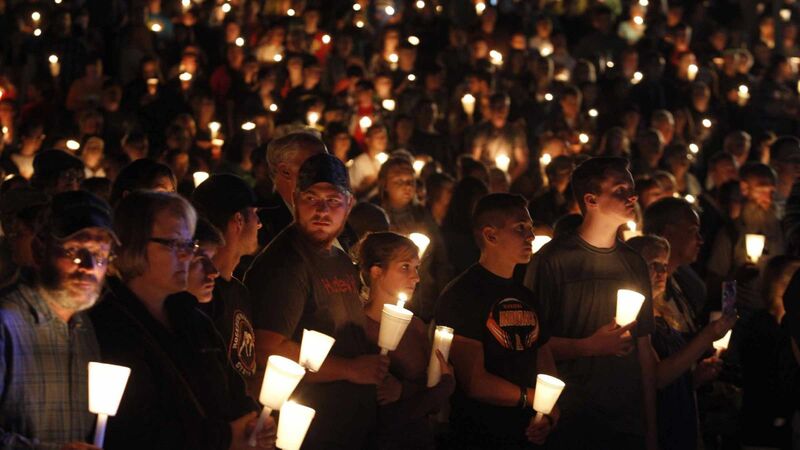 There is no direct link between Asperger’s and gun violence, Metzl said. Other factors in the crime included Lanza’s easy access to guns provided by his mother, a solitary lifestyle and family stress, he said. In Aurora in 2012, James Holmes killed 12 people and injured 70 others inside a movie theater. His lawyers argued in court that he should be found not guilty by reason of insanity. An expert in schizophrenia testified for the defense that the shooting could be linked directly to Holmes’ mental illness. But two court-appointed psychiatrists who examined the shooter concluded he was mentally ill but capable of knowing his actions were wrong. The jury rejected the claim of legal insanity and found Holmes guilty. He’s serving a life sentence with no chance of parole. Drawing conclusions from high-profile crimes is nearly impossible because of the small sample size, said Paul Appelbaum, director of Columbia University’s division of law, ethics and psychiatry. The FBI defines mass murder as killing four or more people during an event. More often, these crimes are attributable to gangs, disgruntled workers or family disputes, he said. “It’s loss of control by people who are extremely angry,” he said. A strategy based only on keeping guns away from the mentally ill would be ineffective because many do not seek psychiatric help, said Appelbaum, who cited the case of Jared Loughner in Arizona. In 2011, Loughner killed six people and severely wounded a congresswoman in Tucson. He had shown obvious signs of mental instability but had not seen a doctor. He legally bought a handgun weeks before and used it in the shooting. Pete Blair, a Texas State University professor who trains law enforcement officers on responding to mass shootings, said it’s easy for people to say the mentally ill shouldn’t have guns. But how to do that gets complicated.